A framing nailer is a tool that simplifies joining tasks when working on a large project. Compared to using a hammer to piece materials together, a framing nailer offers enhanced accuracy. It is similar to a nail gun except that a nailer is suited for big projects and high-powered tasks. A pneumatic nailer relies on an air compressor to supply the required power. 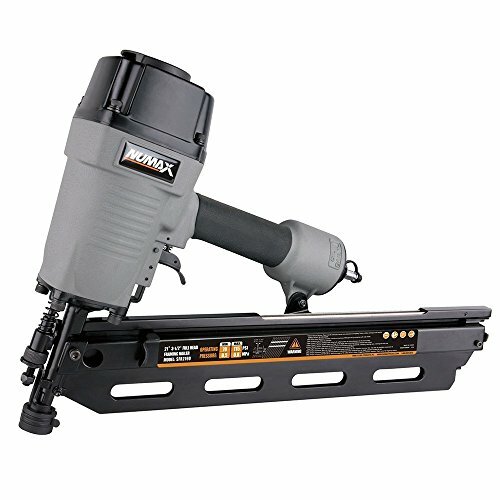 Regardless of the project, DIY or professional woodworking, a pneumatic framing nailer will increase precision and cut significant project time. A pneumatic nailer is appropriate for regular use. Framing nailers come in a wide variety with every one designed for a specific project, so you must know what to look for when choosing a best pneumatic framing nailer. A framing nailer has a magazine where the nails are stored, but the style is in two options; coil or stick. Coil framing nailers have a higher capacity than their stick alternatives, meaning that they accommodate more nails. Due to this, your project requirements will dictate which is more suitable. If your woodworking requires about 100 nails at a time, a coil nailer will serve you better. If you don’t own an air compressor, it is necessary to get one when buying a pneumatic framing nailer. Each nailer has the recommended air volume and air pressure, so the compressor has to meet the minimum limits. If you already have an air compressor for other air tools, make sure that it has sufficient capacity to operate the nailer you intend to purchase. Framing nailers vary based on the nails they can accommodate. Some tools accept clipped-head nails, others round-head nails and some work with all nail types and sizes. A nailer with clipped-head nails will carry more nails than one that accepts round-head ones. The project will, however, dictate the right choice. In some instances, building codes may specify the type of nails required for certain areas. A pneumatic nailer without nail restrictions is a safe bet for this reason. Framing nailers are available in bump or single fire trigger methods. Bump, or contact firing works in rapid succession. The user presses the nailer on the work surface and pulls the trigger. Contact firing is quick, but it is also hard to control. Unintentional firing is more common in bump triggers than other systems. With single fire, you have to press the safety tip on the working surface and then pull the trigger for individual nails, which offers more control. Your specific project needs and tool handling experience will determine the best firing mechanism. If you are used to bump fire, accidental firing may not be such a problem. Besides the primary considerations, you have to look at the specific features of a pneumatic framing nailer to see if it works for you. Manufacturers design framing nailers to provide efficiency and accuracy, which may require making a few adjustments to the basic style of a pneumatic framing nailer. Focus on features that will improve the quality of your work. A protective guard ensures that flying debris doesn’t land on you or the nailer. Kickback debris is particularly an issue when working with metal nails. Opt for a nailer with replaceable protective guards. Your nailer needs proper care to keep functioning optimally, and that means storing it well after use. A carrying case provides the ideal place to keep the tool. Additionally, you can transport the device to different locations without exposing it. Depth adjustment is necessary for accurate nailing. The feature determines how far the nail sinks after firing it. The depth adjustment of the tool can sink the nail flush, leave it protruding, or sometimes, countersink it. Some nailers come with directional exhaust systems, which are necessary when working in dusty conditions. The system directs the nailer exhaust, ensuring a clean operation. Speed is another specification that varies from one pneumatic nailer model to another. Always check the indicated speed before investing in a nailer. For instance, a tool that drives 2 nails/second is perfect for a professional woodworking project. The air connector on a pneumatic nailer will determine the suitability of the tool. Swiveling connectors are preferable because they allow the user to move the air hose without getting it tangled. Look at the safety feature that a specific nailer model comes with. A trigger lock reduces accidental firings; work lights ensure that you have adequate visibility while a rubber grip provides safe handling. Stick to the recognized brands when buying a pneumatic framing nailer. After narrowing down your choices, look at user reviews from objective sites to get second opinions. A nailer may promise good speeds and a firm grip, but you can’t be sure until you use it. Testimonials will make it easier to know what to look for when choosing a best pneumatic framing nailer. Understand your nailing requirements and have a budget before you start shopping for pneumatic nailers.